It’s less than fully accurate to describe Annie, the musical film from director Will Gluck, as an adaptation of the classic show of the same name. Sure, some familiar songs are in there, and the story loosely follows the rags-to-riches path of the original. But the genesis of this Annie is not the broadway stage of the 1970s; it’s late-90s radio. Jay-Z’s “Hard Knock Life (Ghetto Anthem),” a huge hit in late 1998, used the chorus of the musical’s “It’s The Hard Knock Life” to undeniably catchy effect; the single was irresistible, as a hip-hop beat gave surprising heft to the defiant, sing-song melody of the original tune. 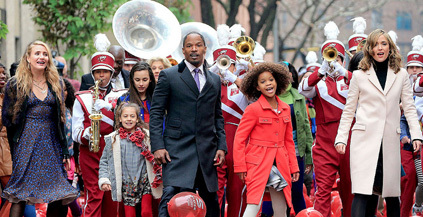 2014’s Annie is that Jay-Z track turned into a full-length movie; an urban retelling of the story for all ages and demographics, with a mix of old songs and (out-of-place) new wannabe hits. Want proof? Jay-Z is a producer on the film. To their credit, Jay-Z and his half-dozen co-producers (also including Will and Jada Pinkett Smith) nearly created a quality adaptation solely with one casting decision. Eleven-year-old former Best Actress nominee Quvenzhané Wallis is beyond perfect as Annie; she doesn’t just carry the tunes, she carries the film with a funny, charming and restrained performance. If Annie is worth seeing, it’s worth seeing for Wallis, who runs circles (figuratively and literally) around most of her cast mates with an irresistible flair. She’s clearly having a great time, and it’s a joy to see.